I’ve lived here south of Fresno for darned near 50 years and I’ve never read Saroyan! Omg! I’ve been to the Saroyan theater – seeing The Nutcracker at Christmas used to be a special treat. I got my teaching credential through the State Uni at Fresno. Okay so I was kind of bored for about the first 1/3 but then it kind of picked up as I got familiar with the characters. At a bit over 1/2 way it fell together and I thoroughly enjoyed the ride. In the days following I grew fonder and fonder of this short work. It’s not a fast-paced book and it’s heavily based on Saroyan’s own childhood in slower and smaller times. His father, Armenak Saroyan, died when he was three (1911) and the children went to an orphanage until his mom Takoohi (to whom The Human Comedy is dedicated) got a job in the packing sheds of Fresno about 5 years later. 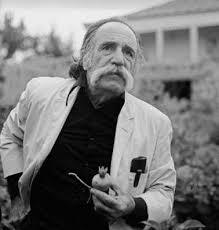 Saroyan and his siblings helped their mom by getting odd jobs. Later he worked in a telegraph office. In 1940 Saroyan won the Pulitzer Prize for his play, The Time of Your Life. He refused it on personal and ethical grounds as he “did not believe in official patronage of art” (commerce should not judge the arts.) He also is quoted as having said the play was not better than his other works. Many of Saroyan’s stories were based on his childhood experiences among the Armenian-American fruit growers of the San Joaquin Valley or dealt with the rootlessness of the immigrant. 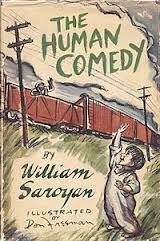 One difference is that Saroyan’s childhood took place before and during WWI, The Human Comedy takes place during WWII. The title of The Human Comedy comes from Dante’s The Divine Comedy. Rather than dealing with heaven, hell and purgatory – Saroyan’s book deals with real life in a small town, during a real war so there’s some real death – and grief – and life goes on. The word comedy here doesn’t mean “funny,” it means “not tragic,” no tragic ending. This short classic is a series of character-driven vignettes and a couple of on-going plot threads strung together chronologically. The continuing themes of home, love, death and friendship are really apparent at the end of the book. The setting of small town US during WWII is vital. (And that’s when was written – this is not an historical novel.) Saroyan’s tone is quite nostalgic and positive although that’s certainly NOT all there is to it – at ALL! There’s also some very deep and pervasive reality and sadness. 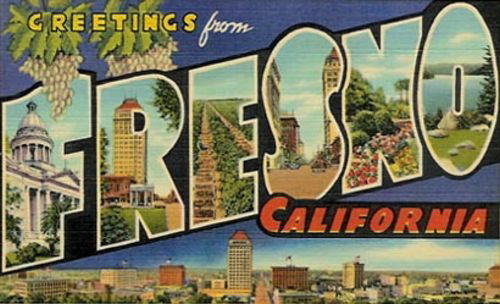 Also, Fresno’s name has been changed to Ithacais – home to many characters in The Odyssey. And the theme of both books, The Human Comedy and Ulysses, is going home. The Greek Ulysses and company are on one long voyage home while many characters in Saroyan’s book have to get home many times – from the telegraph office, from the library (he gets lost), from the train, from the war, from lots of places. Home in Saroyan’s book is where Mother is – and she’s totally faithful, like her counterpart, Penelope. Saroyan could have gone further and emphasize the “away from home” aspect of the Armenian immigrant experience but I think that’s done in his other works. In Saroyan’s Fresno, the Santa Clara Avenue where the Macauley’s live, is on the south side of “Little Armenia,” just barely southwest of downtown old Fresno and the south end of the street is about a block from the railroad tracks (a little section in The Human Comedy). It’s a very short street today, stuck between two major freeways and next to the notorious “G” Street (with crime and shelters and new businesses pushing them out) . Very sad. The old Chinatown (Japanese) is just north and doing better. 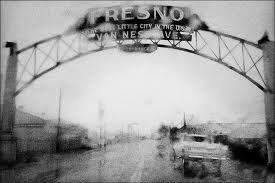 Before World War II, Fresno had many ethnic neighborhoods, including Little Armenia, German Town, Little Italy, and Chinatown. I’d say the population of Fresno in 1943 was about 20,000 but that’s a rough guess. It was 50,000 when I moved here (south of Fresno) in the 1960s and close to 1/2 million today. There was considerable prejudice against Armenians until after WWII. Many families Anglicized their names. The fear was that Armenians would buy up all the land so there were restrictions on land sales to Armenians. 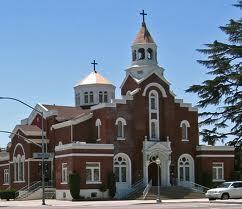 Now about 25,000 to 30,000 Armenians live in Fresno – about 10%. Funny how these things happen Bekah i.e. something close to home is the last thing you come to. This sounds like a great book and a very interesting man. I love your quoted – particularly the one about giving and about not being afraid of people. I wonder if the title is meant to remind us of Balzac’s La comedie humaine. Actually no – not Balzac but Dante! 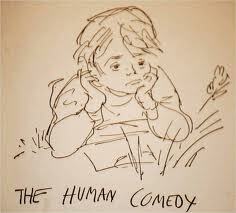 The Human Comedy title is a take off of The Divine Comedy. (I forgot to mention that in my review!) It’s an opposite effect. Where Dante’s work deals with heaven and hell and purgatory, Saroyan’s deals with real life here on the real earth as lived by real people in the middle of a war so death is a big part of it. The word comedy here doesn’t mean “funny,” it means “not tragic.” – I think I’ll add that up there. Thank you!